All the convenience of a glue gun without the cord! Battery operated glue gun allows you the freedom to roam, and get into small spaces without the concerns of a cord. Heats in just minutes. Insulated tip helps prevent accidental burns. Also features a built in work light to help you see your projects. Comes with 3 glue sticks. Twelve pack of refills is Fiskars item 01-004989. Girl...hope no one got this already! I neeeeeeed it! I ordered one hoping they are still available. Maybe in using it some of your genius will appear in my work too. I bought one of these guns, not from you and I do not remember from whom, but the light on the front keeps going off and on and it does not heat up. What can I do about it? Can you help? Thanks. 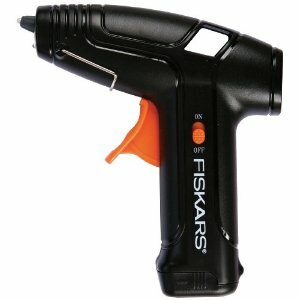 I have contacted Fiskars and they pretty much admitted that battery operated cordless glue guns, especially with lights, never get quite hot enough or last long enough to effectively complete projects. They have stopped making these. I also have the iBond one as well and it has the same issue.